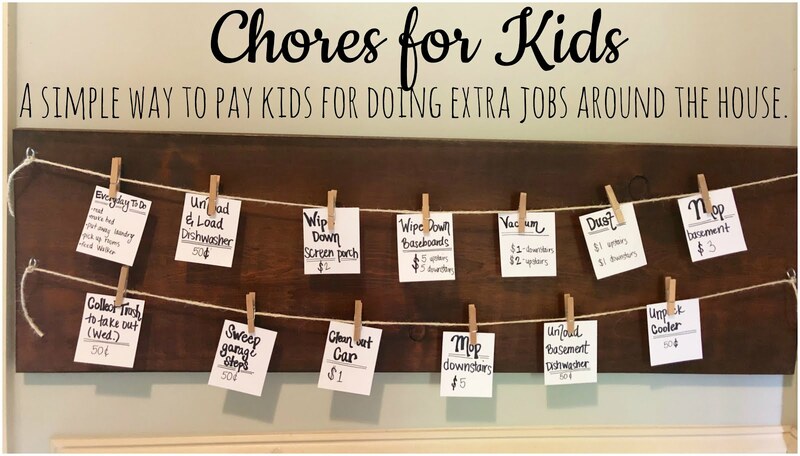 Today I'm chatting all about kids and chores. I am a firm believer that kids should help out around the house. It's a big job to keep a household running and the responsibility of it all often falls on the mamas. During the school year when we have very little down time at home I do most of the work around here. However, summer is a different story! The kids have more time at home and thus more time to help me out. I have always had my kids pitching in to do their part. When they were just toddlers they would help put toys away and put their dirty clothes in hampers. As pre-schoolers the cleaning of the playroom continued and I also started teaching them how to make their beds and they would bring their plates over from the table to the sink. Now that they are older there is no holding back on my part. My kids can vacuum, clean windows, dust, put away laundry and just about any household chore. Some people feel differently about whether or not kids should get paid for doing chores, but I believe that if they are going above and beyond what is expected of them then they should be rewarded. There are certain jobs or chores that they are expected to just do. 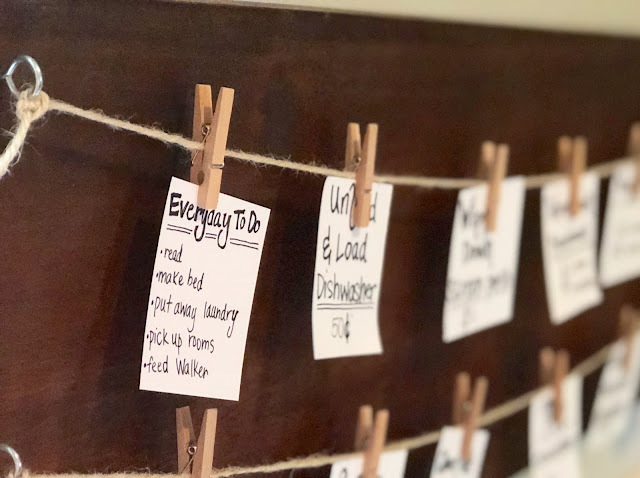 Things like making their bed each morning, feeding our dog, putting away their laundry and cleaning their rooms are chores that they do not get paid for. If they want to help out in other ways that saves me from having to do it, then I'm happy to reward them for their efforts! 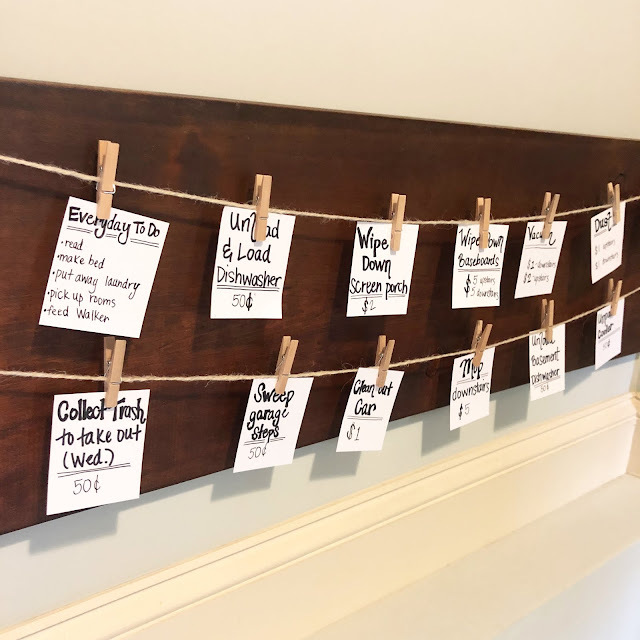 Plus, I think it is really good for kids to be able to earn their own money, learn about saving and spending on items they want with the guidance of parents. A few weeks ago I decided it was time to retire our reward jars. 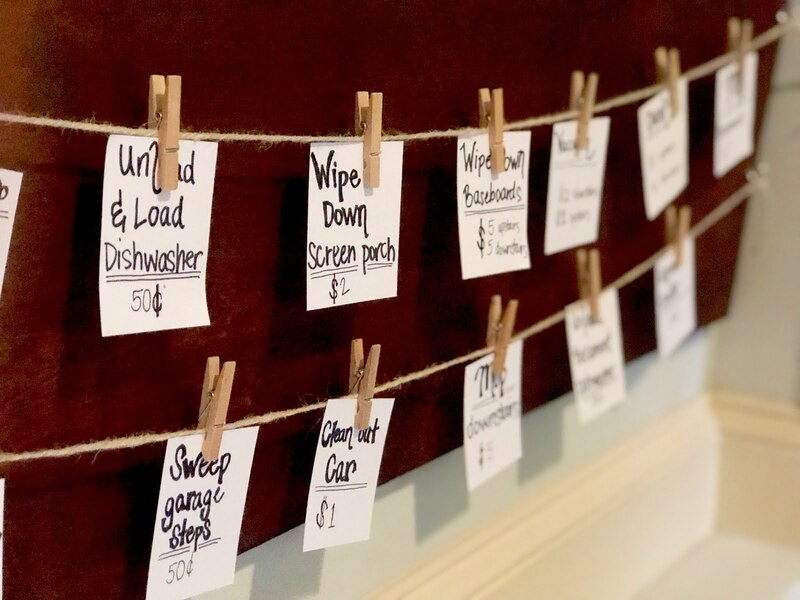 They served us well for several years, but my kids were ready for the next phase of chores organization and they are all super motivated to earn cold hard cash instead of the promise of a toy or treat. Concession stands at baseball tournaments, vending machines at camps, and special items they wish for are all now within their reach. I had the Mr. help me with this chores board and it was really so simple. We took a wooden board and he attached picture hanging wire to the back of it. Next he drilled small holes for these hooks to go in and I tied jute twine across the board so I could clip different jobs available. Now, the newness of this has worn off just a bit, but the kids are still checking it out and helping with lots of different things around the house. Basically nothing is required, but if they would like to earn a little money, they can check the board, perform the job and come to me to request their pay. So far this new system is working out just how I had envisioned it would. They are happy earning some extra money and I'm happy not having do do all the work around here. It's a win-win in my book!